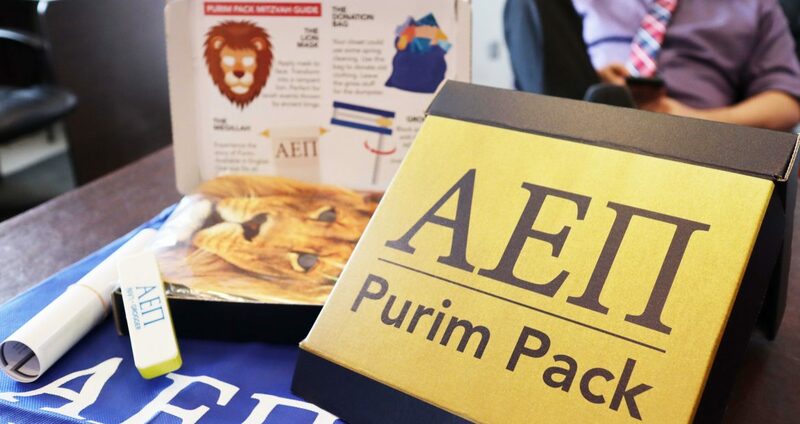 Alpha Epsilon Pi International Fraternity (AEPi), the world’s leading Jewish fraternity, is helping some of its nearly 190 chapters celebrate the Jewish holiday of Purim by sending them Purim Packs, self-enclosed boxes with all of the necessary materials to help chapters celebrate the Jewish holiday of Purim. Purim commemorates the saving of the Jewish people in ancient Persia from Haman, who was planning to kill all the Jews, as recorded in the Biblical Book of Esther. The holiday begins at sunset on Wednesday, March 20 and runs through sunset on Thursday, March 21. 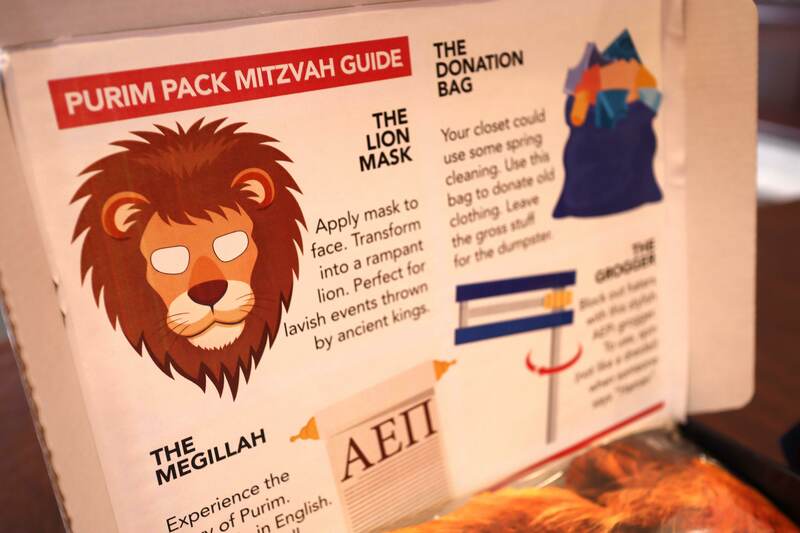 Each Purim Pack comes complete with a lion mask, clothing donation bag, an English language Megillah (the story of Purim as told in the Book of Esther) and AEPi grogger (a noisemaker traditionally used to drown out the name of Haman during the reading of the Megillah). One of the “Mitzvahs” of the holiday is giving gifts to the needy “matanot l’evyonim”. Included in each Purim Pack is a bag for students to pack old clothes in and directions on how to donate those clothes to those who may need them. 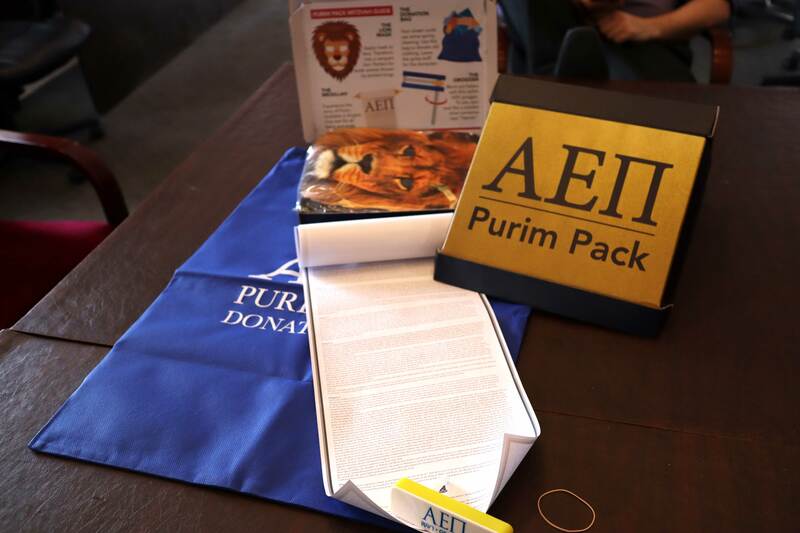 The Purim Packs are made possible through a grant from the Alpha Epsilon Pi Foundation and the Jim Joseph Foundation. “We’re excited to see our chapters use their Purim Packs to help celebrate the holiday. Through programs like these, we are able to continue to accomplish AEPi’s mission of developing the future leaders of the Jewish community,”said AEPi’s Chief Executive Officer, Jim Fleischer. Alpha Epsilon Pi (AEPi) is the world’s leading Jewish college fraternity, operating chapters, colonies and interest groups on nearly 190 college campuses in six countries. Founded in 1913, AEPi has more than 90,000 living alumni. While non-discriminatory, the fraternity’s mission – developing the future leaders of the Jewish communities – is demonstrated every day through acts of Brotherhood, Tzedakah (charity), social awareness and support for Jewish communities and Israel.